President of the Massachusetts Nurses Association Donna Kelly-Williams flanked by nurses conceding on the ballot question Yes on 1 at the Massachusetts Nurses Association. The bitter fight over a ballot question to regulate nurse staffing is over. The debate at the heart of the costly battle is not. 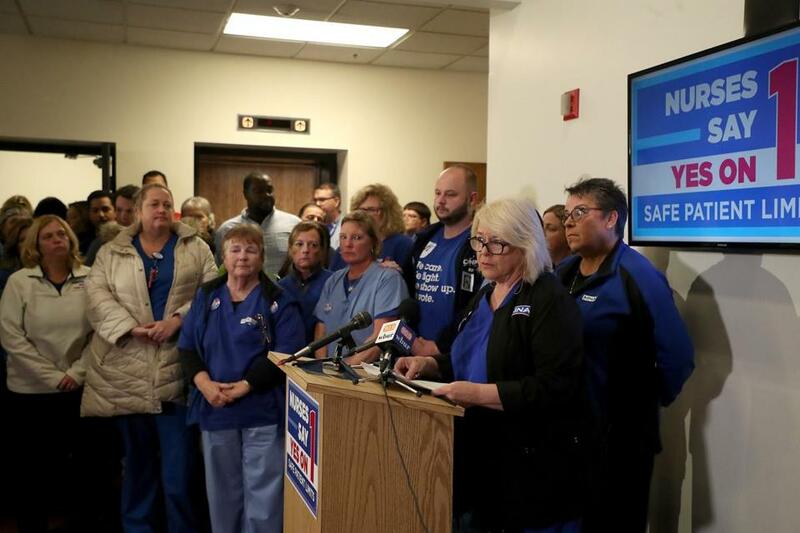 Question 1 forced a complicated health care issue into the spotlight, and though it was soundly defeated, supporters and opponents both said Wednesday that the publicity had raised awareness about the stressful and difficult job of nurses. Steve Walsh, president of the Massachusetts Health & Hospital Association, said hospitals want to “turn the page” on the campaign season. But he said the debate will inform hospital leaders as they work to address broader workforce issues, including stress and burnout among doctors and nurses. While both sides in the ballot fight said they were open to sitting down and talking about workforce issues, neither side had reached out to the other to begin that dialogue. The rift was still fresh a day after the election. Question 1, which would have set strict limits on the numbers of patients assigned to nurses working in hospitals, was overwhelmingly defeated in Tuesday’s election, with 70 percent of voters rejecting the question. The nurses union had argued that patient limits were necessary to help overworked nurses provide the best possible care to patients. Hospitals had warned that the measure would raise costs and impede access to important medical services. Kathy Schuler, chief nursing officer at Winchester Hospital, was among the many executives opposed to Question 1. But Schuler said with the campaign behind them, hospital leaders will reach out to nurses to discuss other strategies for improving work conditions. “We have learned that we need to be more in tune with staff nurses . . . and more in tune with the stress staff nurses carry with them each day,” Schuler said. More than1.8 million people voted against Question 1. That’s more than the number who voted to reelect Governor Charlie Baker or US Senator Elizabeth Warren. About 771,000 people voted in favor of the question. Schildmeier attributed the lopsided result to the “ridiculous amounts of money” hospitals spent on the effort to defeat the measure, which included running television ads warning about the potentially dire consequences of a “yes” vote. Hospitals poured $25 million into their campaign, more than twice the union’s $12 million. “It is hard to win when you’re outspent 2 to 1, even if you run a flawless campaign,” said Joe Baerlein, a consultant who has worked on past ballot campaigns. “The fact that voters said ratios aren’t the right solution doesn’t mean voters were saying there aren’t issues with our nursing workforce,” said state Senator Jason M. Lewis, a Winchester Democrat and cochairman of the Legislature’s Joint Committee on Public Health. Lewis, who opposed Question 1, said the ballot debate raised important health care quality and safety issues that the Legislature could work to address. For example, he said, the state should require hospitals to set standards for the handling of patients to prevent injuries to nurses, and also require hospitals to develop plans to prevent workplace violence. House majority leader Ronald Mariano, a Quincy Democrat, also opposed the ballot measure. “I don’t think the role for the Legislature is to determine ratios and how to manage a hospital,” he said. But Mariano added that he’s open to considering more creative ways to address nurse staffing issues. Judith Shindul-Rothschild, a professor of nursing at Boston College who supported Question 1, was skeptical that conversations with hospital executives and legislators would lead to change. “The way forward, I think, is to keep educating the public,” she said. “Although there was this stunning defeat — and there’s no other way to describe it — one of the beauties of living in a democracy is you can pick yourself up and learn and go forward,” Shindul-Rothschild said.